The people at RuralVotes work for progress. We strive to create a better future for our communities and are actively engaged in the world around us. We write about seemingly intractable problems and highlight people who are finding innovative solutions. Sometimes, we discover that our words and our efforts join a larger movement for transformational change. Yes, the book suggests alternatives and positive actions (and that section, not surprisingly, is where Miryam shows up). Yet, even the book’s title, “Eaarth,” underscores the point that the world many of us grew up on, the forever dependable and hospitable homeland is gone. 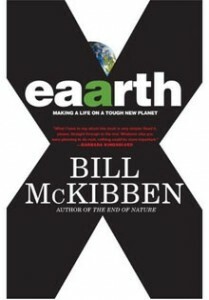 It has been replaced by an increasingly savage landscape that McKibben says we need to adapt to, and fast. In case you are tempted to dismiss McKibben’s opus as left-wing propaganda strategically aimed at derailing vital business growth, consider the concerns of our stalwart U.S. military. Besides worrying about sixty-three of its own coastal facilities that are in danger of flooding as sea level rises, the Defense Department has begun planning for a future where “climate change will require mass mobilizations of the military to cope with humanitarian disasters,” according to the book. Musings on irrevocably changed economic systems as a result of climate change are appearing in the Wall Street Journal, as well as in reports compiled by conservative and very methodical scientists and researchers. I should note here that even the recently introduced Kerry-Lieberman bill in response to climate change has caused a bit of a firestorm among some environmentalists. “The American Power Act” if approved by Congress (This congress? Next? Ever?) would reduce U.S. oil dependence and importing; cut our carbon emission levels by 80 percent by 2050; increase renewable and nuclear energy from 8 percent of U.S. energy supplies to 16 and 14 percent respectively, mandate carbon sequestration and the retro-fitting of aging coal-fired power plants, improve energy efficiency in homes, businesses and automobiles, and yes, create many jobs. Not to be too grim, but even that Act, if passed today, would still not be enough according to McKibben. He says that we’ve already waited too long and that we need to be focusing on 2020 or sooner. Critical changes needed to foster “functional independence” include a dramatic shift away from industrial agriculture, new food growing and food distribution networks as well as better pay for farmers, and all of us getting involved in the production of what we eat; a complete rejection of fossil fuels within a few years; a great deal of locally produced energy; an end to bloated military budgets and foreign wars, and a focus instead on the security of our own neighborhoods. This complements another part of McKibben’s book in which he urges us to jettison “the neighborless lifestyle” and the isolating “hyper-individualism” of our modern world. He sees internet use (locally powered wherever possible) as a key for communities to disseminate practical knowledge, from composting to literacy teaching. One of the most moving sections of “Eaarth,” details the ways in which the Internet, rather like an old Town Crier or now defunct hometown newspaper, helped one Vermont town become a vital community inhabited by people who know, help, learn from and celebrate each other. McKibben notes wryly that contrary to those who say that limits to growth are somehow un-American, America’s history has been shaped since the beginning by the debate between “bigness and smallness,” between the ideas of local control and Federalism, community-based decision making and federal mandates. It is also refreshing to read McKibben’s recognition of the values inherent in rural life. He suggests that people need to stop thinking of farming as “a low-rung occupation,” and rural life as somehow “backward.” And he emphasizes this by saying that wherever we live, in suburbs or in cities, we need to get more involved in producing what we eat. McKibben has founded an organization called 350.org, which last year held 5,200 actions in 181 countries that demanded climate change solutions, a feat that CNN called “the most widespread day of political action in the planet’s history.” That was just a beginning, and not a political victory, according to McKibben. This year’s plan for coordinated global action reflects the motto of 350.org, “Get to Work,” and is more ambitious. Scheduled for the unforgettable date of 10/10/10, the goal is to have the world’s citizens install solar panels on rooftops, erect windmills, insulate homes, plant trees, launch or harvest community gardens, and much more. The nuts and bolts will be followed by concrete demands on both national and local leaders. To paraphrase the challenge at 350.org: OK, look what we did in one day. What about you??? If we can cover a school roof with solar panels, surely you can pass the legislation and sign the treaties that will spread the work everywhere and confront the climate crisis in time. When I started writing this column, I was listening to the thunk and thud of yet another torrential rain storm, the kind we get all the time now in western Massachusetts. It’s not the soft spring rain that nurtures the crops, but the harsh rains you see in the Tropics, the merciless kind that floods fields and roads and washes away bridges. I just want to say I am just very new to blogging and site-building and truly liked this blog. Very likely I’m want to bookmark your site . You absolutely have good writings. Bless you for sharing your webpage.